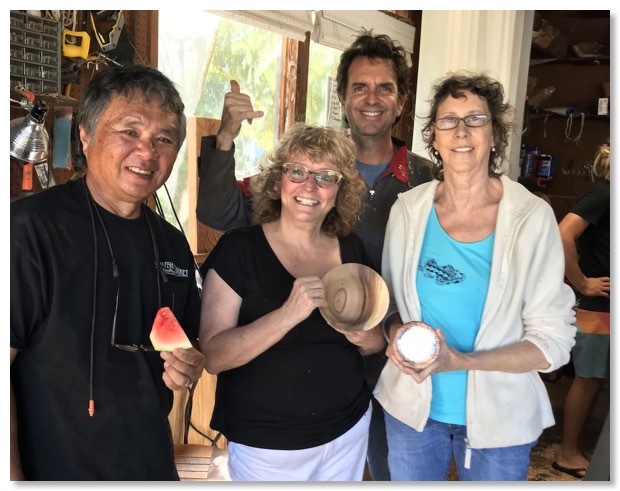 Maui Woodturners Association Secretary and treasurer Wayne Omura, Ann Trygstad, yours truly and Terry Murphy with their first completed project ever with the Mike Hunter Tools new "Viceroy" tool!! I’m a late comer to the world of carbide tools. I have watched closely with some curiosity thru out the years, their arrival, development, types and various manufacturers. I’m very confortable with a bowl gouge, I can do 90 % of my work with it. Never felt the need for carbide. Then I was given an article assignment. It required the use of hand held hollowing tools. 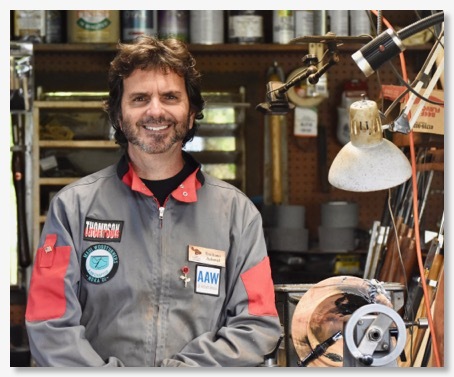 I contacted Mike Hunter, owner of Hunter Tools. He expertly advised me on tool selection. I purchased the ones needed to do the piece for the article, and a few other ones. A few days later a box arrived. Upon opening the box and taking a look at the tools the first word that went thru my mind was: quality. I successfully completed the project for the article. I was impressed by the ease of use of these tools, the quality of the cut, and what I like best: I didn’t have to stop once to sharpen, saving invaluable time. One of the tools that I purchased is the Viceroy tool. The tool has a square shank. This design takes the guessing out of what position or angle you are supposed to hold it. You simply slide it left to right on the tool rest. You can also tilt it at a 45 degrees for a bevel supported cut that produces a sheer cut that leaves an excellent surface, making it a versatile tool, one that a beginner can grow into. As you feel more confortable, you can start trying the more advanced cuts. The Viceroy comes with a 6mm round cupped carbide cutter. The 6mm is one of the most efficient cutters, a good compromise of size and aggressiveness. With little practice you can rough out a bowl as fast or faster than with a traditional bowl gouge. You can also take surprisingly good finishing cuts, and tilting it produces a beautiful sheer scrape that leaves a surface that needs little sanding, starting perhaps at 180 or 220 grit. I would not be excited about this tool if it wasn’t for one thing, without any practice, I did a small bowl, I didn’t have any catches, none. Granted, I’m an experienced woodturner with years of experience, so obviously I have the principles of turning down. Then, I had an idea. I wanted to try the tool with our group of new beginners club members. We were going to have a meeting soon, part of the meeting was already set up as a mentoring class. After dealing with some club issues, announcements and our popular wood raffle, we divided the 5 beginner turners into groups. Meetings for the Maui Woodturners Association are held at my studio. 4 lathes are available. I decide to mentor Ann. She’s a retired nurse and decided to take up woodturning as a hobby, something to do in her new found extra time. She got very lucky and was offered an older, in great condition Vicmarc VL300. Not a lathe associated with a beginner, but one thing is for sure, she will never feel the need for an upgrade. At one of our past club meetings Ann won a gift certificate for a Carter & Sons turning tools Co. She chose to apply it to the purchase of a 5/8 bowl gouge with an Irish grind. I had mentored Ann before at other club meetings, some spindle turning, coves, beads etc, with a 1/2 in spindle gouge. She was also being mentored by another club member in her small shop. She tried turning a bowl, a big powerful motor on her Vicmark and a 5/8 bowl bowl gouge, a recipe for disaster if you are an unsupervised beginner, not ready for it the task, and only Youtube as your teacher on bowl turning. Not surprisingly, a few weeks ago she called me to see if I wanted to buy her lathe. I detected a lot of frustration, and a little bit of fear in her voice. I had just lost a new club member, a newly retired person, let’s call him Paul, due to frustration. Paul told me that he thought turning was easier, he didn’t want to put the time into it to get better, he would just purchase bowls from me when he needed some gifts, then added, cheaper and safer! Paul, against our advice, didn’t take the advantage of mentoring offered by the club, he said he had seen enough videos on youTube and he could do it. I was determined not to loose Ann. The club provided some simple projects for the class. Ann chose to make a tea light holder. I put a piece of wood on the lathe, gave all the beginners a quick lesson on how to use the Viceroy. Then it was Ann’s turn. She started hesitantly first, but with each passing minute confidence built up. Simply moving the Viceroy left to right, she quickly brought the square to a cylinder. I helped with the tenon, and we put the now round blank on a chuck. We measured the tea light, marked it, and now we needed to hollow out a recess, on the end grain. Without explaining to her the difficulties of doing this with a traditional tool, a spindle gouge, I let Ann do it. She slowly started, left to right, tool flat on the tool rest. A bonafide beginner successfully hollowed out a recess on end grain, in front of my eyes, without a catch! The surface left by the 6mm cutter was a glossy one on the Primavera wood, not that it needed it but I instructed her to start sanding at 220. We drew some sketches of the possibilities on the design, she decided on one and proceded to finish it, with a huge smile on her face. I helped her part it off with a thin parting tool. She was in utter disbelief holding the precious little completed project in her hand, her very first one, success! I wish I could take credit for her being able to complete a project, but the truth is, it was possible in such short time due to the ease of use and simplicity of the Viceroy tool. It is the perfect tool for the hobbyist woodturner that finds traditional tools intimidating or doesn’t have the time to learn how to use them. Another great advantage is that she doesn’t have to buy a bench grinder. Ann’s goal is to be able to turn things for herself, trinkets for her kitchen, a cereal bowl for breakfast, a gift for a friend’s birthday… With the Viceroy tool she will be able to accomplish all that. For Ann’s situation this is the right tool. We have decided to get new turners started on this tool. Get them turning, make a few projects, get them confortable on the lathe. Then decide if they want to try traditional tools, I always recommend a bowl gouge with an Ellsworth grind as the first traditional tool. After all, what matters is the final product. Does it matter what tool you used if what you bring to show us at the club meeting is a beautiful turned item? 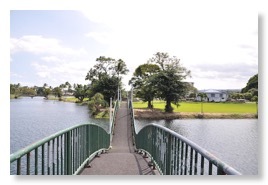 Some people might not want to pay for replacement cutters once they need to be replaced. In my opinion the amount of time saved due to that they do not requiere sharpening, they are well worth the price.